The Hampton Inn Houston/Deer Park Ship Area hotel is located 15 minutes from downtown Houston between Pasadena and LaPorte Texas off of State Highway 225 and Center Street. Surrounding industries include over 200 refinery and chemical plants the Port of Houston and the San Jacinto College System. Nearby the Hampton Inn Houston/Deer Park hotel are attractions that include Houston Texas attractions such as San Jacinto Battlegrounds Battleship Texas Cruise Lines Pasadena Livestock Show and Rodeo Battleground Golf Course and Kemah Boardwalk. The NASA Space Center which is 20 miles south of the hotel and Six Flags Astroworld/Waterworld Reliant Stadium Minute Maid Park and the Medical Center are located approximately 15 miles west of the Hampton Inn Houston/Deer Park hotel This modern hotel offers 63 interior corridor guestrooms including executive king rooms and a two-bedroom suite. 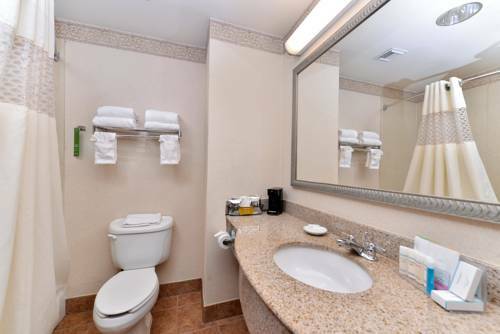 Each room at the Hampton Inn Houston/Deer Park hotel is equipped with a microwave refrigerator high-speed internet cable television with complimentaryHBO pay-per-view movies coffeemaker iron ironing board and hair dryer. A fully equipped exercise facility business center and outdoor pool and spa are available for our Hampton Inn hotel guests* use. The Hampton Inn Houston/Deer Park hotel meeting room facility can accommodate up to 130 people sitting theater style and up to 60 people sitting classroom style excellent for training and social functions. Enjoy your visit to the Houston/Deer Park Texas area at the Hampton Inn hotel with our complimentary hot breakfast every morning in our spacious lobby overlooking the hotel*s pool and spa We love having you here in Texas at the Hampton Inn Houston/Deer Park hotel.